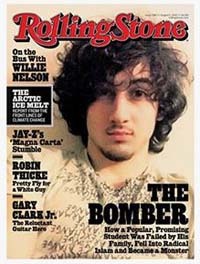 The cover of the August issue of Rolling Stone magazine won’t feature a rock star or actor. Instead, on August 3, fans will find a full cover photo of Boston marathon bombing suspect Dzhokhar Tsarnaev. The cover story is written by Rolling Stone contributing editor Janet Reitman. In the story she reveals that “Jahar,” as his friends called him, once said that the attacks on America by Islamist terrorists on 9/11/2001 were justified. Not everyone thinks this cover image is a great idea. Users of Twitter and Facebook condemned the magazine for glamorizing the accused bomber on its cover. But Dzhokhar has his fans, to be sure. A flock of smitten young women, for instance, have frequently gathered outside a U.S. District Court in Boston when the suspected bomber is there for appearances before magistrates. They’ve carried signs and worn t-shirt festooned with the suspect’s image. Fans have also been using the hashtag “freejahar” on Twitter to drum up support. Peter Finocchiaro of Huffington Post noted that this isn’t the only time the music magazine featured a killer on its cover. In 1970 the magazine featured a full cover photo of the notorious Charles Manson. Meanwhile, several store chains have decided they will not be selling this particular issue and won’t have it on their magazine shelves. CVS drug stores announced it would not sell the controversial August issue, and so did by New England-based grocery store chain Tedeschi Foods, as did Walgreens, Rite-Aid, and Kmart. The magazine’s managing editor, Will Dana, waved off any criticism of his decision to put the murderer on the cover of the magazine. In an interview with NPR’s Melissa Block, Dana said the story and cover is par for the course for his magazine.